This quintessentially British sitcom is about Grace Brothers, a department store in London which is owned and kept traditional (e.g. precise dress code for ladies frills and men's hats according to rank) by two brothers who look old enough to have fought in the Boer war but rarely appear. 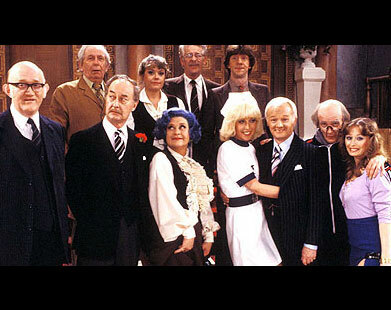 Most scenes play on one floor where Mr. Cuthbert Rumbold is the executive (meaning he enjoys an endless parade of foxy but stupid secretaries) in charge of management while his dignified floor walker, Captain Stephen Peacock, has daily charge over two small sales teams. The fat and bossy, implicitly man-hungry widow Mrs. Betty Slocombe supervises the attractive Miss Shirley Brahms (with a terribly common Cockney accent) in the sale of women's clothes and accessories. A ton of other fun and eccentric personalities make an appearance. Their interaction with each other and the customers is quite formal in principle, but turns out comical in practice.